I love the way Geoffrey got the ensign on the back of the launch in this photo of Camilla leaving Lindi. I assume it’s a red ensign – the Union flag in the top left corner and plain red for the rest. That’s used by merchant (commercial) shipping; the blue ensign, with a royal blue ground, is used by the forces. It’s easy to forget that the station needed boats to get to the flying boats, for passengers, mail, customs, refuelling, any restocking needed, and any engineering requirements. Geoffrey was all too aware of the fact, from the checklist he made of requirements for stocking the station, to his epic journey from Butiaba to Juba, when he was required to move the station, lock, stock and barrel. 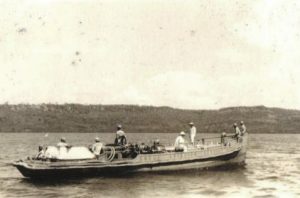 The picture bottom right shows both boats, the launch and the Shell barge, lashed to the Corynton paddle steamer as they were transferred across Lake Albert and down the Nile. 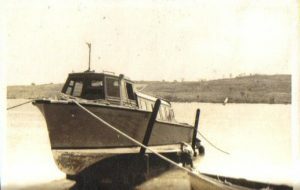 At Lindi, the water was tidal, and the launch appears to be moored on a cradle so it can move up and down the beach. 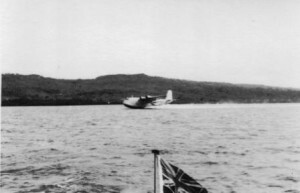 That was used for all the Imperial Airways business with the flying boat, and included a radio set, as Geoffrey mentions when talking about Juba, since the radio operator set up in there before they had a proper terminal. The ‘Shell barge’ gave me a lot of trouble when I first started transcribing Geoffrey’s tapes. It was very late on when I realised it was the Shell company’s refuelling barge! 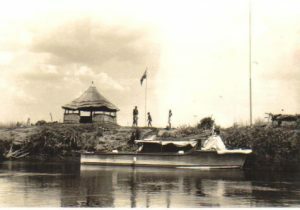 I’m not sure whether it was already at Lindi when Geoffrey arrived, or whether they had a ‘Shell man” but had to bring in their own barge for him. Maybe I should check with Shell’s archivist some time. 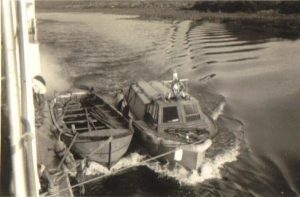 One incident concerning the boats (and there are quite a few) was when Lindi was visited by H M S Emerald. Geoffrey was very proud of the way his local crew saw the smart behaviour of the navy boys, and set up their own drill to show that IA was no slouch either! Apparently the effect was ruined when the ship fired a salute as it left, which the staff weren’t expecting, and it caused all sorts of panic!